Heartworms are found in the heart and large adjacent vessels of infected dogs. The female worm is 6 to 14 inches (15 to 36 cm) long and 1/8 inch (5 mm) wide; the male is about half the size of the female. One dog may have as many as 300 worms. Adult heartworms live in the heart and pulmonary arteries of infected dogs. They have been found in other areas of the body, but this is unusual. They survive up to 5 years and, during this time, the female produces millions of young (microfilaria). These microfilaria live in the bloodstream, mainly in the small blood vessels. 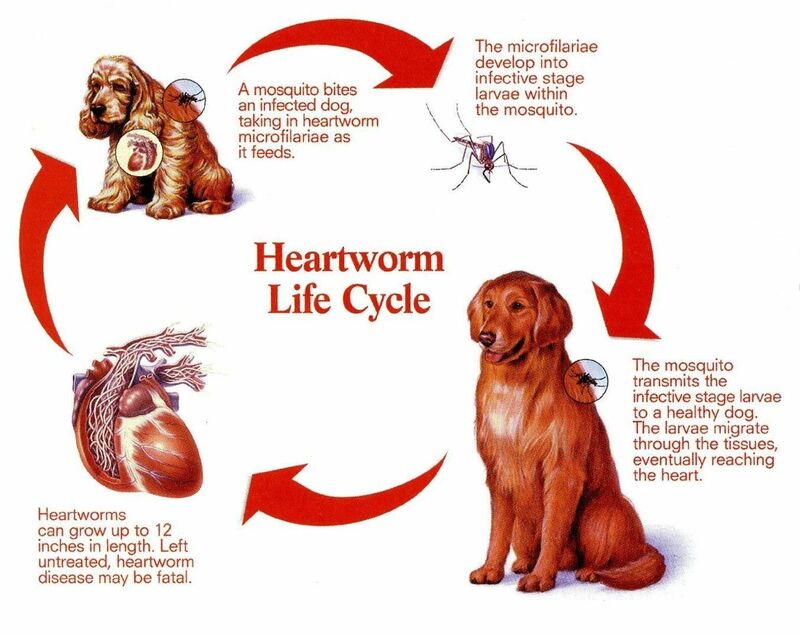 The immature heartworms cannot complete the entire life cycle in the dog; the mosquito is required for some stages of the heartworm life cycle. The microfilaria are therefore not infective (cannot grow to adulthood) in the dog--although they do cause problems. As many as 30 species of mosquitoes can transmit heartworms. The female mosquito bites the infected dog and ingests the microfilariae during a blood meal. The microfilariae develop further for 10 to 30 days in the mosquito and then enter the mouthparts of the mosquito. The microfilariae are now called infective larvae because at this stage of development, they will grow to adulthood when they enter a dog. The mosquito bites the dog where the haircoat is thinnest. However, having long hair does not prevent a dog from getting heartworms. Most dogs infected with heartworms do not show any signs of disease for as long as 2 years. Unfortunately, by the time signs are seen, the disease is well advanced. 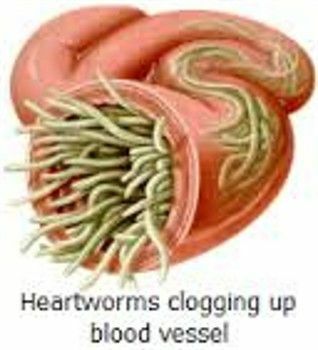 The signs of heartworm disease depend on the number of adult worms present, the location of the worms, the length of time the worms have been present, and the degree of damage to the heart, lungs, liver, and kidneys from the adult worms and the microfilariae. Echocardiography: (Sonogram): An echocardiogram allows us to see into the heart chambers and even visualize the heartworms themselves. Although somewhat expensive, this procedure can diagnose heartworms when other tests fail. There is some risk involved in treating dogs with heartworms, although fatalities are rare. In the past, the drug used to treat heartworms contained arsenic so toxic effects and reactions occurred somewhat frequently. Now a newer drug is available that does not have the toxic side effects of the old one. We are able to successfully treat more than 95% of dogs with heartworms. Treatment to kill adult worms: An injectable drug to kill adult heartworms is drug is given for two days. It kills the adult heartworms in the heart and adjacent vessels. Complete rest essential after treatment: The adult worms die in a few days and start to decompose. As they break up, they are carried to the lungs, where they lodge in the small blood vessels and are eventually reabsorbed by the body. This is a dangerous period, and it is absolutely essential that the dog be kept quiet and not be allowed to exercise for 1 month following treatment. The first week after the injections is very critical because the worms are dying. A cough is noticeable for 7 to 8 weeks after treatment in many heavily infected dogs. Treatment to kill microfilaria: Approximately 1 month following treatment to kill the adults, the dog is returned to the hospital for administration of a drug to kill microfilariae. Your dog needs to stay in the hospital for the day. Seven to ten days later a test is performed to determine if microfilariae are present. If they have been all killed, the treatment is complete. If there are still some present in the blood, treatment for microfilariae is repeated. 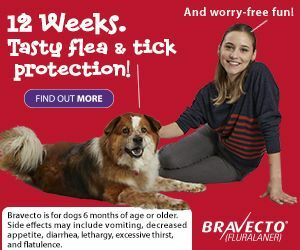 When a dog has been successfully treated for heartworms, you cannot sit back and relax because dogs can be reinfected. 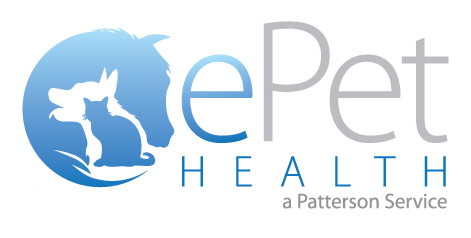 Therefore, it is essential to begin a heartworm prevention program. There are three drugs that can be used to prevent heartworm infection. One is a daily, chewable tablet; the others are chewable tablets that are given only once monthly. All three products are very safe and very effective. Their costs are essentially identical. One of these should be started immediately after the treatment is completed.